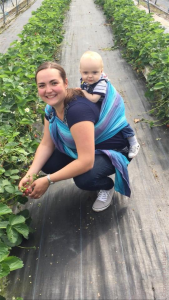 York Sling Library provides expert support to enable local parents to carry their children in comfortable, safe slings or carriers. The library stocks two types of asymmetric slings (slings which are supported over one shoulder). Ring slings are one of the simplest of all slings in terms of design, yet can be tricky to fully master. They are made from a piece of woven wrap fabric approximately 1.8 m long with a pair of metal rings sewn into a loop at one end. The sling is created by threading the opposite end of the fabric through the rings and back on itself. 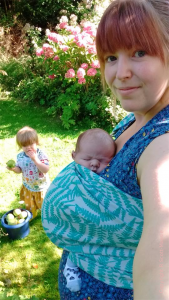 Worn over one shoulder this asymmetric sling is suitable for all ages – comfortable for newborns, as a front carry, older babies as a hip carry or back carry for bigger kids. These slings are great for quick ups and downs for active toddlers. Our other asymmetric sling is the Scootababy. This is a hip carrier designed to offer a comfortable hip carry position for babies who like to sit on your hip and watch the world go by. Simple to get into and reassuringly secure when on, this asymmetric sling has a padded waist band and a fleecy capped shoulder, which spreads the child’s weight without digging in. This can be a great way into slings for an older baby who is not very used to the ergonomic carrying positions, and equally can be useful for anyone who would find a ring sling convenient but has a child who likes to pop their seat. Asymmetric Slings in the library collection include ring slings by Ali Dover, Little Fellows and Storchenweige, and a Scootababy Carrier.